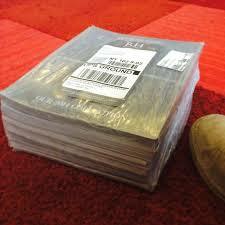 I just received the biggest catalog I've ever received: a 15 pounder from Restoration Hardware with 3,200 pages in 13 sections. This kind of retro marketing seems backward or forward....I can't decide which. Most retailers are dramatically pulling back on the number of catalogs they mail out due to the Internet. But Restoration Hardware is going back to the days when retail shops were showrooms and everything has to be special ordered and shipped to the home. Then there is the issue of paper. In a time where sending out a 3,200 hundred page catalog might seem environmentally insensitive, RH spins the accusation into cotton candy by arguing that the big catalog drop is actually environmentally friendly because, according to a company email, sending only one catalog per year equates to a lighter carbon footprint. Last year the catalog was only half as large but RH CEO Gary Friedman said the expansion will make consumers think, "Wow, these guys have a lot." By that logic, Sears and J.C. Penney ought to bring back their general merchandise catalogs to pull themselves out of a deep, deep hole. Despite my grumbling, Friedman knows what he's doing. He probably knows that at Williams-Sonoma, (Pottery Barn, West Elm) 70 percent of sales are catalog driven. Or that women aged 18 to 30 love catalogs as a way to interest them in a brand, according to a survey by Kurt Salmon. When Friedman took over as CEO of RH in 2001, the company was almost bankrupt. During the recession he raised prices and quality when everyone else was lowering theirs. In 2013 the company had record profits of $69 million up 52% from the previous year, according to SEC filings. His latest change is to add more design centers similar to the one that opened in Boston last year, a 40,000 square foot megacenter complete with cafe, wine bar, fountains and art installations. The company wants to add even more of them, including rumors of one at the Galleria. The Edina store already gobbled up its back room storage areas and expanded the showroom. A much larger store could be in its future. Luxury retail analyst Pam Danziger said that RH really understands how affluent American want to decorate their homes. "They understand people who are house-proud," she said. Apparently, that means putting down the "Atas Shrugged" for the weekend and picking up Restoration Hardware's 13-parter.